If you want to save money on your purchases, perhaps you should try using some other app than Shopping Suggestion. As you can easily tell from its name, this browser extension is developed to provide you with the most relevant information when it comes to online shopping coupons and discount offers, but the reliability of this extension and all the other associated third parties is highly questionable. The problem is that unintentionally Shopping Suggestion could expose you to malware infection, and that is definitely something every one of us wants to avoid while browsing the Internet. Perhaps you have come across Shopping Suggestion at shoppingsuggestion.com. This website looks professional enough to convince you that the extension can definitely provide you with the most relevant shopping information. However, Shopping Suggestion, which is said to be compatible with Google Chrome, Internet Explorer and Mozilla Firefox, cannot be downloaded from the official website at the time of writing, and users still complain that they are getting Shopping Suggestion installed on their computers. The question arises, then, how does this extension enter a system? The answer is actually more than simple – bundled downloads. Although Shopping Suggestion is a browser extension it is also considered an adware application, and it is of no surprise that the application can easily be distributed bundled with other types of shareware and adware. Such applications are always available for download at third party file hosting web pages. 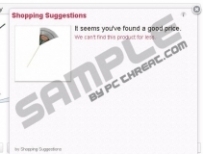 Shopping Suggestion and similar apps are not designed for malware infection, but they COULD be exploited by malevolent third parties to display their content. And you can be sure that Shopping Suggestion will display a lot of things. One of the reasons why this application is classified as adware is that it constantly displays annoying pop-ups, whenever you access supported websites. It also ads a “See Similar” button to the main browser window, which appears right next to your future purchase on eBay, Amazon or any other online shopping website. Clicking or hovering your mouse above the button opens a drop-down menu that displays a number of other similar offers. There might be really alluring offers out there, presented to you by Shopping Suggestion, but you can never be sure that the content of the ads are safe – Shopping Suggestion does not review the advertising network content, and basically any third party that makes use of advertising networks to promote their content, can embed their links into Shopping Suggestion ads. In the long run it could expose you to potential computer threats, and might even lead to a malware infection (although not necessarily). 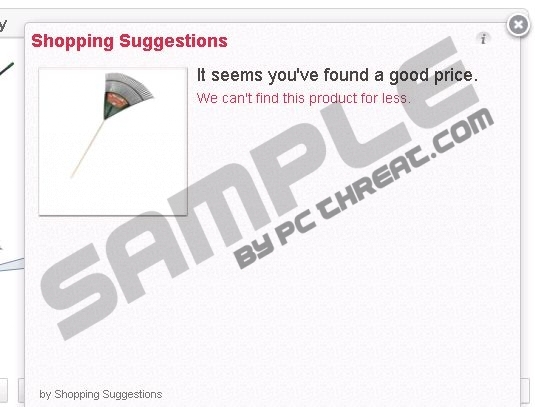 Hence, if you want to protect your PC and avoid potential system security issues, you should remove Shopping Suggestion from your computer. Follow the manual removal instructions provided below to get rid of the application, and afterwards launch a full system scan with SpyHunter free scanner, because this way you will definitely know whether your computer is absolutely safe or not. Get yourself a trustworthy antimalware application if need be. Select Uninstall a program and remove Shopping Suggestion. Go to Uninstall a program and remove Shopping Suggestion. Go to Add or remove programs and uninstall Shopping Suggestion. Disable and remove Shopping Suggestion from Toolbars and Extensions. Disable and remove Shopping Suggestion from Extensions. Click Extensions and remove Shopping Suggestion from the list. Quick & tested solution for Shopping Suggestion removal.